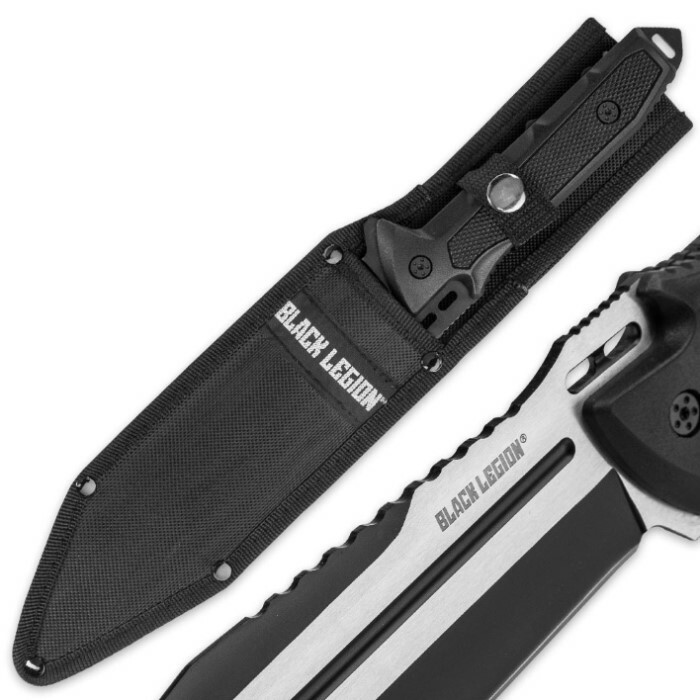 When you’re on a mission, you absolutely must have a fixed blade knife that will stand up to whatever challenges you have to face. Black Legion’s "No Holds Barred" Fixed Blade Knife is ready to go to the wall and the distance with you on every excursion! 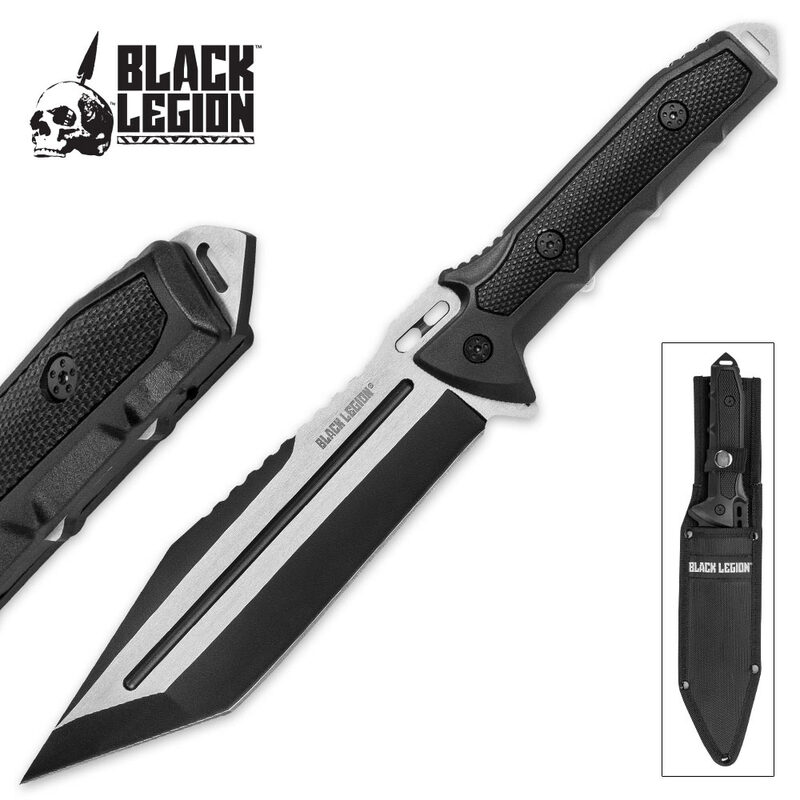 The 7” 3Cr13 stainless steel blade is razor sharp and boasts a keen piercing point. The full tang blade features a distinctive blood groove, wicked jimping and a sleek two-tone black-and-brushed-steel finish. The tactical handle is molded from an advanced polymer reinforced with nylon fiber and includes a finely textured no-slip grip. House the menacing fixed blade in the included nylon belt sheath for maximum protection and easy transport. When your mission is “no holds barred,” make sure your go-to fixed blade is, too! This knife appears solidly built. The full tang blade is a little thinner than it should be but this isn’t a hand me down quality knife. If you need such a knife it should do the job you ask of it. Even if it only does it once. True to what you see in the preview pictures. It's a large, solid, wicked piercing tool. The edge that came with it shaved hair off my arm. The sheath is simple, yet well made and good looking. I am happy with this purchase. Also-full tang, and I have no worry that if I batonned wood that the blade would have problems. Good deal for the price. If you like how it looks, don't hesitate. 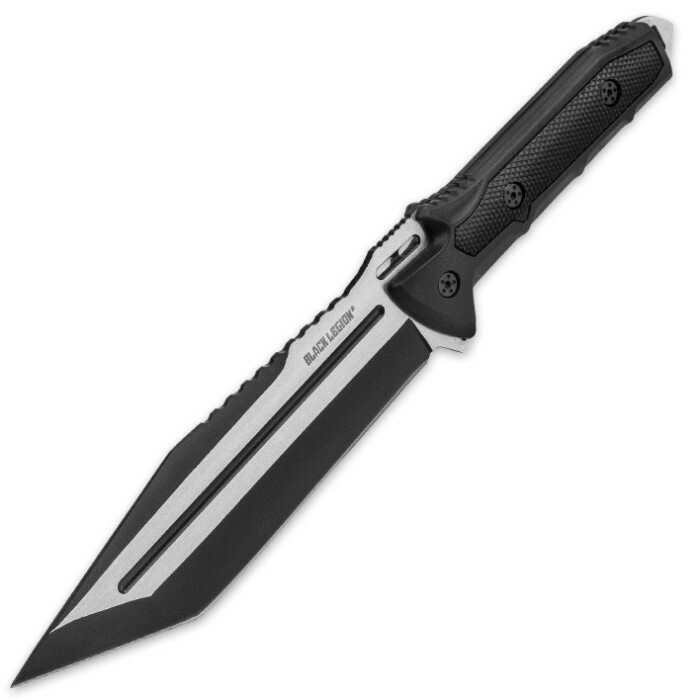 This is the perfect combat blade. Take it from a professional, it will kill.. !!! This was my first time ordering from True Swords and I have to say, my expectations have been blown out the water. My package arrived unbelievably fast and I received a high quality blade. This knife is sturdy, well balanced and really sharp. I'm already looking forward to my next purchase. Thank you so much True Swords! This knife is way better than the picture! It has excellent weight and it fits the hand perfectly. It is so cool I might have a kydex sheath made for the knife. This knife comes pretty sharp from the factory. Nice heft to it and the handle is surprisingly comfortable. The best knife I’ve seen for the money. Highly recommended. I didn't know this knife was gonna be so AWESOME!! Mine came seriously sharp. On top of the fact that it's absolutely mean looking. Good sturdy handle too. Black Legion never lets me down. Thanks BudK! Worth the money, Sharp out of the box. Good weight, not too heavy, not too light. Sheath a little tight and may get cut up with frequent draw out and reinsertion of the knife. Tom from Hawaii.